Re-made, re-branded and re-marketed. A welcome return for the 9800GTX? It's not an evil, deceitful ploy to sell you a crappy card, but it's not a budget performance king either. Much has been made of Nvidia's decision to release the GTS 250, mostly down to the fact that the 512MB parts are identical to the practically defunct 9800 GTX, itself a limited reworking of the now-ancient 8800GTX. Now, we've been praying for the green side of the graphics sphere to simplify its naming structure and with this re-branding of the G92 GPU it's done it, so this is obviously a good thing. Right? Unfortunately there simply isn't a place for this card right now. With the recent price-cut of the GTX 260, an eminently excellent card, the two stand disturbingly close in the wallet stakes, but a country mile apart in terms of performance. The naming culture may have been simplified but the pricing structure perpetuates the lie that the GTS 250 offers a viable alternative to its stable-mate. It's not necessarily Nvidia's fault though, I don't think even they expected AMD to make such a recovery. Certainly not a strong enough one to force the price cuts that have seen the GTX 260 drop well below the £200 mark, squeezing the already paper thin margins for the distributors. Gigabyte's version though is simply a re-badged 9800 GTX. This 1GB, overclocked offering doesn't carry the die-shrunk G92b GPU, but still sits on a redesigned PCB. 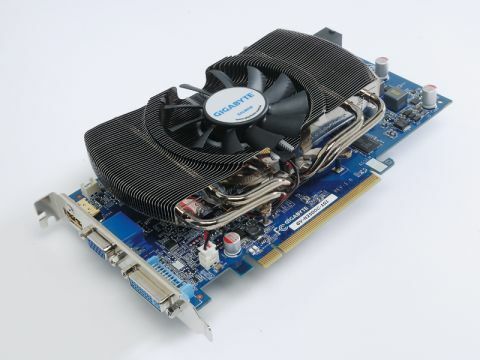 Gigabyte uses its motherboard tech on the board design to increase voltage stability, has added a tweaked cooler to help drop the GPU temperature further past the reference design, and clocked it a fairly miserly 63MHz above the original 9800 GTX, but with headroom to spare. Unfortunately none of these tweaks can help it escape the fact that an extra £30 nets you a card that severely outperforms it. Essentially the GTS 250 is running on years-old technology and in some benchmarks, it offers half the performance of the GTX 260. That said, the GTS 250 is positioned to be in direct competition with AMD's 4850. At the lower end of the resolution spectrum the 4850 stands tall, but as soon as you crank it up, the extra memory of the GTS 250 starts to come into its own. It's no real surprise then that Nvidia has entered into this re-branding phase – it already had a card to compete with the mid-range of AMD boards, though inevitably consumers will go for the newer release every time. Sound thinking from a business side, and possibly vital for Nvidia's continued development. Still, what it has over the 4850 is at high resolutions and if you've got the sort of a monitor to make the most of it, realistically you'll save up for an extra week and get a GTX 260 instead. At least, that's what we'd do.